A legend says that the Wizard Gandalf had brought such a stone from Valinor. He gave the Elessar to the Elven Lady Galadriel, and remarked prophetically that she would pass it to another, who will also be called Elessar. From this would come his royal name Elessar (Quenya for 'Elfstone'), and he would be a healer and a renewer. When Aragorn was two years old, his father was slain when an Orc arrow pierced his eye. As was the tradition of his people, Aragorn was fostered in Rivendell by Elrond as if he was his own son. By Elrond's order, his identity was kept secret, as he feared he would be slain like his father and grandfather. Aragorn was named Estel (Sindarin for 'Hope') instead. During his life in Rivendell he accompanied the sons of Elrond, Elrohir and Elladan, on their journeys. Elrond revealed to 'Estel' his true name and ancestry when he returned from a journey with Elrohir and Elladan in T.A. 2952, when Aragorn was twenty-one years old; as part of this revelation, he delivered to him the heirlooms of his House: the shards of Narsil and the Ring of Barahir. Later, Aragorn met and fell in love with Arwen, daughter of Elrond, who had newly returned from Lothlórien. From T.A. 2957 to T.A. 2980 Aragorn took great journeys, serving in the armies of King Thengel of Rohan, and Steward Ecthelion II of Gondor. Many of his tasks weakened Sauron and his allies, which during the War of the Ring helped the West survive. His name in Gondor and Rohan was Thorongil (Sindarin for 'Eagle of the Star'), and became one of Ecthelion II's most important advisers. He warned Ecthelion of the Corsairs of Umbar, who threatened the Southern Fiefs and was eventually allowed by Ecthelion to attack Umbar. He led a Surprise Attack on the Havens of Umbar with a few Gondorian ships, destroying many of their ships and slaying its lord with only few casualties. After his return in Pelargir he crossed the Anduin and left Gondor to travel into the far East and South 'exploring the hearts of men good and evil' and learning about the 'plots and devices' of the servants of the Dark Lord. In the year 3001, as a now revealed Sauron continued to regain power in Mordor, Aragorn began assisting Gandalf in his search for news of Gollum. Gandalf suspected that the ring Bilbo Baggins found near Gollum's lake was in fact the One Ring. In T.A. 3007, he shortly returns to Eriador where he visits his mother for the last time, she dies before that year's spring. In 3017 after searching intermittently over the years, Aragorn finally overtakes Gollum in the Dead Marshes on 1 February. 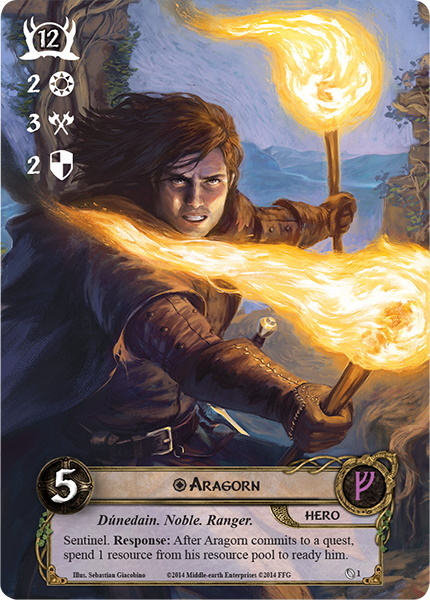 With Gollum he travelled through the northern Emyn Muil, to prevent being found by Sauron's spies, and crossed the Anduin at the Sarn Gebir. He travelled further north along the edges of Fangorn Forest and through Lothlórien, where the Elves sent a message to Gandalf. 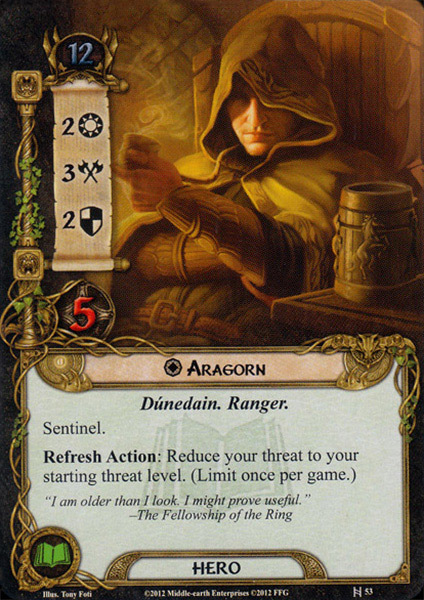 He travelled alongside the Anduin to the north until he arrived at the Carrock. With the aid of the Beornings he crossed the Anduin with Gollum and entered Mirkwood. He took Gollum to Thranduil in to be held captive. He then returns west where he meets with Gandalf at Sarn Ford and learns of Frodo Baggins' plan to leave the shire with the Ring late September and then went to his own journey. He met Éomer in the fields of Rohan, and an instant friendship formed, both feeling the honesty and lordliness of the other. 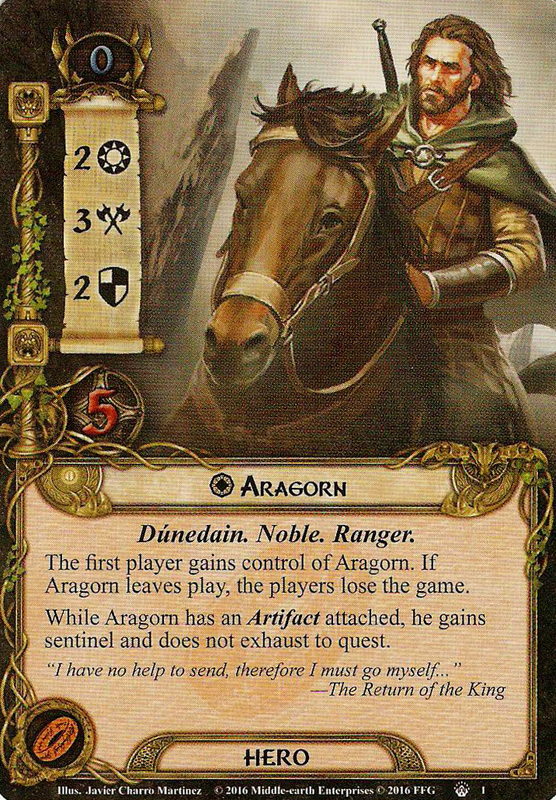 Éomer took a risk for his sake, giving him horses, with the promise that one day soon Aragorn would return to Edoras. Aragorn, tracking the Hobbits, followed into Fangorn Forest, where he met the resurrected Gandalf the White. After the restoration of Théoden, he rode to Helm's Deep to fight in the Battle of the Hornburg. There he, alongside his new-found 'brother' Éomer, and King Théoden, marshaled the defense against Saruman’s army. 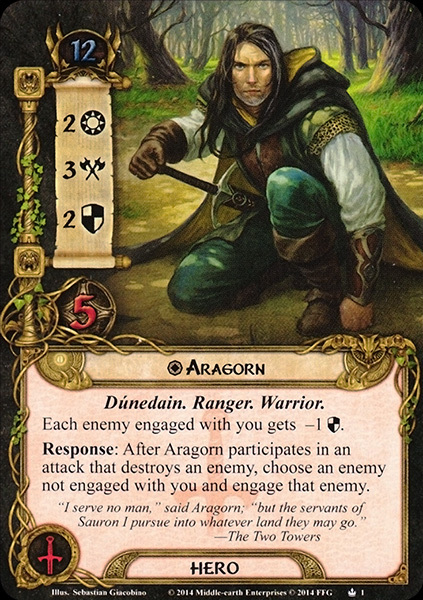 His revealed majesty upon the battlements of the Hornburg as he waited for the dawn caused some of the Wild men to pause and shudder, and he heralded the return of Gandalf with Erkenbrand. After Pippin’s terrifying experience with the Orthanc-stone, Gandalf presented it in a formal manner to Aragorn, its rightful master, who hinted that it would be used by him eventually. 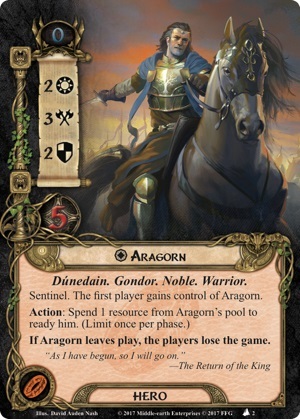 After the departure of Gandalf and Pippin to Minas Tirith, he rode for a while longer with Théoden, meeting up with his friend Halbarad of the North, Elladan and Elrohir, and a company of staunch and fearless Rangers. Elladan and Elrohir gave him a message from Elrond: 'The days are short. If thou art in haste, remember the Paths of the Dead'. Halbarad bore a gift from the Lady Arwen – the Standard of Elendil. Aragorn knew the path set before him. Aragorn, furling his banner, appointed Imrahil the temporary lord of the City, as the law demanded. Eventually, however, Aragorn did come to the Houses of Healing, where he tended and restored Merry, Éowyn, and Faramir, in accordance with the prophecy 'The hands of the king are the hands of a healer, and so shall the rightful king be known'. 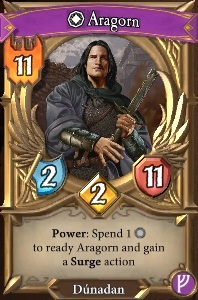 Aragorn then left the city, hooded and cloaked, and yet the people of Minas Tirith followed him, for they had heard rumours. Yet when in the morning they saw the banner of Dol Amroth, they wondered if the Return of the King had been but a dream. Some days after his coronation, Gandalf took Elessar up the slopes of Mount Mindolluin, and there he found the scion of Nimloth, the symbol of his mastery of the Reunited Kingdom. Elrond and Arwen came to Gondor and Elrond gave Elessar the Sceptre of Annúminas signifying the Kingship of Arnor. He wedded Arwen on Midsummer's day of 3019, and then was forced to bid his old friends farewell. He turned back to his new kingdom as the Fourth Age dawned and the Ring-bearers left the shores of Middle-earth forever. One of his first tasks in the reordering of his realm was the restoration of Orthanc and ordered the Orthanc-stone to be returned there. With this opportunity, many secrets and hoarded treasures were revealed including the Elendilmir which Saruman took from Isildur's body. Elessar received the Elemdilmir with reverence and took it with him as he established his full kingship of Arnor. 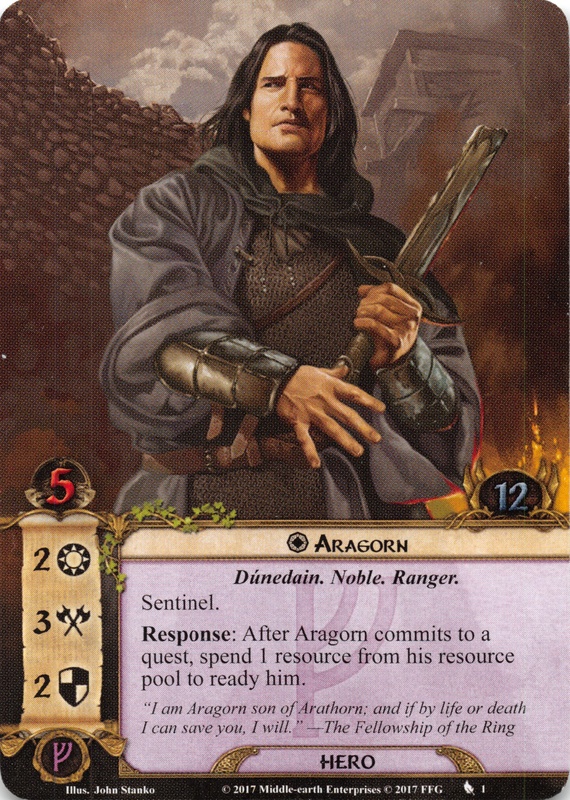 Elessar gave his Steward Faramir the title Lord of Emyn Arnen and created him as Prince of Ithilien. He declared the Drúadan Forest to belong to the Drúedain and a protected enclave of his Kingdom. He also re-established the Great Council of Gondor whose chief councillor was the Steward. He also renewed the Oath of Cirion with Éomer. 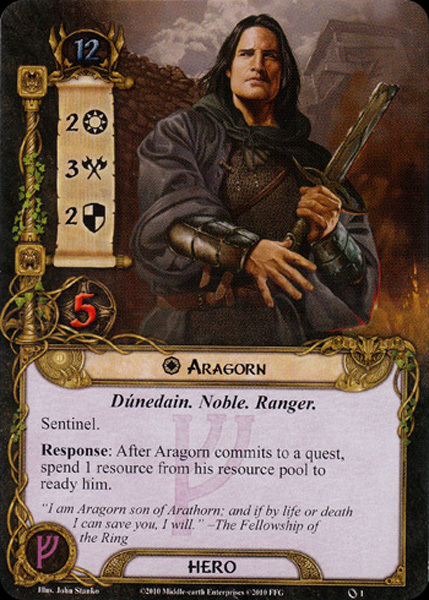 The name Aragorn is Sindarin, meaning 'Revered King', from aran ('king') and (n)gorn ('dreaded, revered'). Ruth S. Noel and several others proposed 'King of the Tree', but Tolkien specifically said that this was not the case. David Salo deduces 'Having Kingly Valor' from Tolkien's cryptic “'Kingly Valour' (for so is that name interpreted)”. This is still the most often cited etymology; Robert Ireland's A Tolkien Dictionary gives the variation 'Royal Zeal'. Carl F. Hostetter proposed the meanings 'King of the Globe' or 'King of the Hill' in his analysis of the King's Letter. Thorongil - S 'Eagle of the Star', a pseudonym used in Gondor and Rohan. Pronounced [θoˈroŋɡil]. 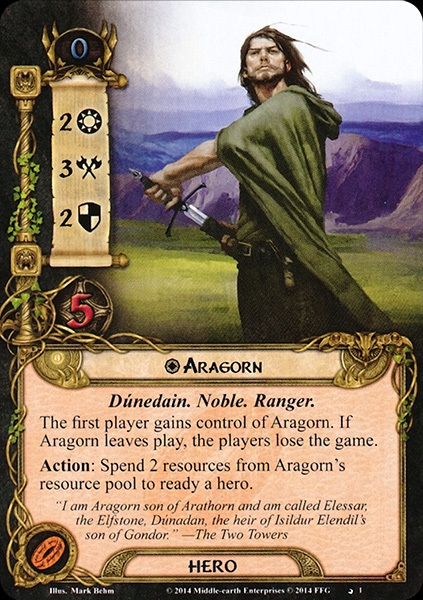 Elessar - Q 'Elfstone', Aragorn's name as a king. 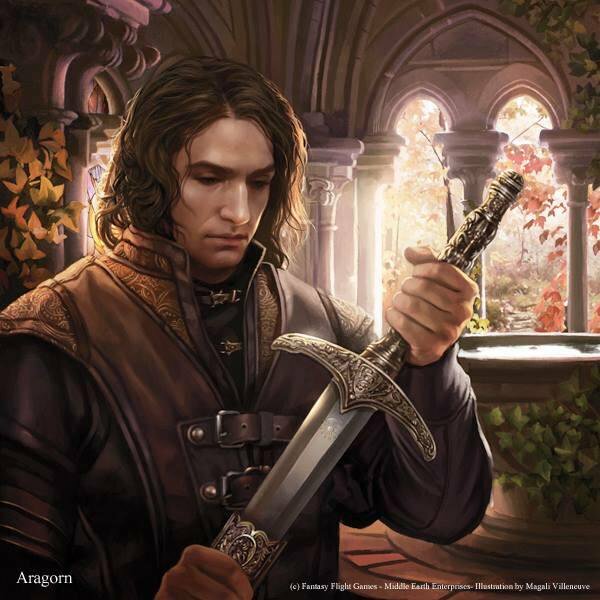 Despite popular use as such, Aragorn was never known as 'Aragorn Elessar', 'Aragorn II Elessar' or 'King Aragorn'. Pronounced [eˈlesːar]. Estel - Q. Usually glossed as 'Hope', the concept estel more widely means 'hope, trust, a temper of mind, steady fixed in purpose, and difficult to dissuade and unlikely to fall into despair or abandon its purpose'. Pronounced [ˈestel]. Telcontar - A Quenya form of 'Strider', this was the name of Elessar's Royal House. It was not used independently. Pronounced [telˈkontar]. The Dúnadan - 'Man of the West', a name given by Bilbo Baggins when their friendship evolved. Arakorno - A rare Quenya form of Aragorn, which only appeared in a discussion about the words for Quenya and Pronounced [ˌaraˈkorno].